Beautifully detailed exterior architecture of the Library of Parliament is part of the Centre Block of the Parliament Buildings on Parliament Hill, City of Ottawa, Ontario, Canada. 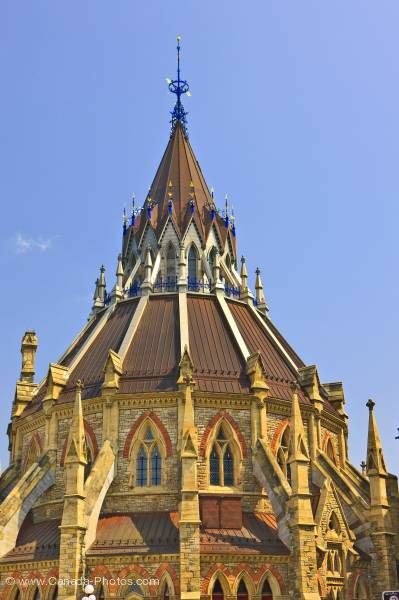 Gothic architecture of the Library of Parliament’s exterior is wonderfully displayed with its arched windows, flying buttresses and spires decorate this round structure in its many stone layers. Exterior of the Library of Parliament in the Centre Block of the Parliament Buildings on Parliament Hill, City of Ottawa, Ontario, Canada.